As a little girl, I used to daydream about motherhood. What would it be like to have a baby of my very own? To hold, change, carry, and snuggle. What would it be like, I wondered from as far back as I can remember, to be the mommy? How I hoped I could be like my own mother. The snow day Monday, Steve stayed home from work and couldn’t play with the kids at all or come near me because he was feeling so bad. This was a bummer, but boy oh boy did we have quite a week in store for us. This was truly the calm before the storm. Tuesday was another snow day, and I did have such a great morning with Cohen, but then it was off to the hospital with Hudson for an I.V. and an injection. This radioactive substance attached to the Neuroblastoma in his body and let us know, head-to-toe, where everything was for sure. Checking into Medical Imaging Jan. 7. There were so many sick kids out there, and they didn’t have a room for Hudson, so we had to hang out in the back hallway. Finally, after one blown vein, they put his IV in his hand using a red light and a hand-warmer to spot the vein. Poor guy. Sweeties and a hospital lavender-scented pacifier always do the trick to help ease the pain, though. The only time he will take a paci is when he is in pain. My sweet boy. We finally made it home and Steve was feeling sick still. He went on a run to get some medicine, but never made it there because there was a pipe burst in our rental property. A pipe burst near the water heater causing it to dump its entire contents and everything it was trying to refill onto the ceiling causing it to cave in. All flooring on the first floor, the entire ceiling on the first floor, counters and cabinets in the kitchen must be replaced. While I was on the phone with the insurance, I had Hudson screaming wanting to nurse, Cohen grabbing my hand to play, and Hattie dropping a ball on my lap to throw. All in all quite a stressful evening, I must say. Oh yes, and earlier that day I realized Hudson is losing his hair. Chemo will do that, and we totally expected it. So, I took some pictures before it started falling out to celebrate and remember the hair he was born with. We also did a little at-home hair cut the day I found the first of it in his bed and some that came out in my hands. So, I gathered myself up after mourning the beautiful hair I was so (foolishly) proud of and decided to celebrate it instead. Though I feel good about everything, I will admit I even shed tears writing this and looking at the pictures, still. I don’t know why this one little thing is so hard for me. Most babies don’t have this much hair anyway, and it will grow back, but for some reason it strikes such a spot in my heart and makes me ache every time I think about it or more hair is left behind on his sheets, carseat, or my shirt. That was the hair he came into this world with. It was such a wonderful day, and his hair was quite the topic of conversation as I was delivering him. I just remember how beautiful my baby was upon entering this world almost four short months ago, and I guess I’m selfishly not quite ready to give that up. Stupid, I know, but it’s the (ugly) truth. 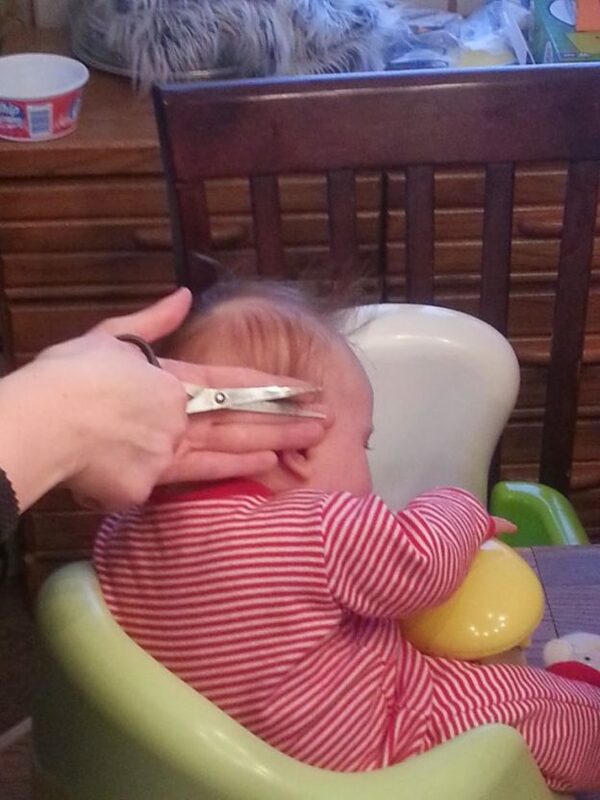 First haircut. I only trimmed up the ears and back. I left the top long figuring it’d be short soon enough, and we could still just enjoy his sweet little curls a bit longer. Big brother helping while Mommy pumped before Hudson’s scan. He couldn’t eat anything before his MIBG. This scan required light sedation (which he’s already had twice now) to double check and make sure everything (head-to-toe) is right where we think it is. This first picture is of our nurse getting his Broviac line ready for the sedation and me helping to keep him calm. Our respiratory therapist (who is wonderful) snuggling Hudson to help him sleep and our nurse administering thesedation while our technician in Nuclear Medicine got the scanner ready. I had to step away because he was trying to stay awake to look at me. When he finally fell asleep, I fell apart crying because he just goes so still. I know he’s okay. I hear the monitors. It’s just a not-so-great thing to watch. If you look closely you can count three butterflies. The butterfly is the symbol of the lost baby, of which we have three in heaven. Just a little God thing to give me a bit of comfort during a really tough day. His oxygen levels didn’t dip too low, but they put in tubes just to be extra careful. They strap him in really tight to keep him safe. In the middle of the scan, he wet his diaper. When they had to change him because it was blocking the view of the scanner, he woke and they had to sedate him more. I cried and cried. When every part of you wants to hold your baby and help him, but you can’t, it can nearly drive you crazy and most certainly will break your heart. Home. Sleeping and sleeping and following the family rule of never waking a sleeping baby. Hudson came out of the scan and nursed like a champ. That night at home, however he was not able to get milk from me. This was so upsetting. My mom went to make a bottle of my frozen milk for him, and I had to leave the room because he will refuse a bottle if he can see, hear, or smell me at all. I went into my room, laid on my bed, and sobbed. I was just so drained emotionally from the day, from what was to come Thursday with chemo, and I just fell down on the bed and let it all out. I think I needed to. Doing all of this by myself at the hospital, I have to hold everything together, and I’m glad in a way that I finally had something that made me release those emotions. Then, I got to thinking about what I had eaten that day with all the stress and being at the hospital had brought. About 500 calories.For the entire day. I wiped my tears away, ran downstairs and started grabbing the best foods I could to replenish my supply. I pumped that night around 10 so my body knew I still needed to produce milk, and by morning we were back in business. Thank goodness this happened with my second baby, so I knew how to process what was happening, and I didn’t think I was just drying up! Thank you, Lord! Thursday morning we were back in the clinic for a full day of chemotherapy. This was Hudson’s second round, and this day made everything else we had been through (and would go through in the next couple days) totally worth it. Our sweet nurse hooking Hudson to the chemotherapy. Dr. Dole. A gift from God. At Hudson’s exam, Dr. Dole immediately said that the tumor was MUCH smaller! He had me feel it to show me! He said two weeks ago when he pushed on his tummy it was “Right there to greet me,” but Thursday it was harder to find, but I definitely felt it. Dr. Dole told us the following news: Hudson’s tumor has gotten considerably smaller, his genetic testing all came back favorable and low-risk, and Hudson will have a normal life expectancy! Tears of joy! Thank you, thank you thank you, LORD!!! My momma took the day from work to be with me during this day of chemo. She snuck this picture of us when I heard the great news about genetic testing. I’m so glad she did. I want to remember everything about this wonderful moment forever!! 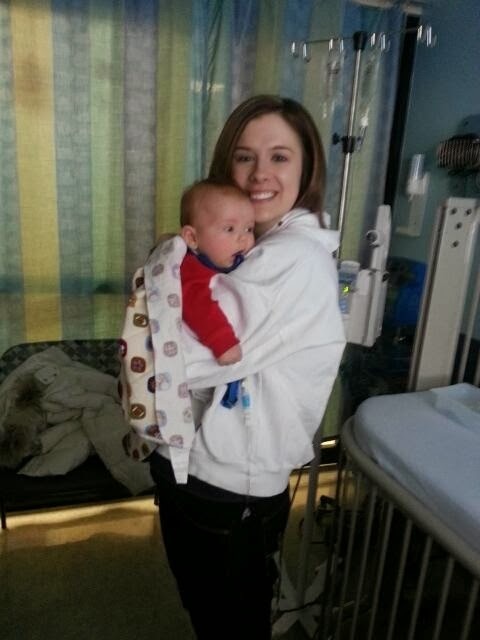 Mommy and Hudson ready to take on another round of chemo! Listening to Grammy read “Mr. Brown Can Moo” and making my heart happy. Before Hudson was born, I wondered how I would give one-on-one time to this new baby like I did Cohen. I thought Hudson’s time with me as a newborn would be so different from Cohen’s. While it is different in many ways, look at all the extra Mommy-Hudson time we are getting! Every hour we change a diaper for each day of chemo and for 48 hours after the round of chemotherapy is over. So thankful my mom came with me for this six hour treatment that turned into ten hours in the hospital before we got to go home. With Steve working and Cohen needing him, I have been doing all treatments and appointments alone, and having her there to take care of me was really nice. Can’t hold this guy down. Tummy time during treatment to keep up with his milestones. Such a beautiful Thursday, but we would quickly realize, tough times were not quite finished in the Marshall house. Friday, Steve took both he and Cohen to the doctor. The night before, while in the middle of hourly diaper changes, Steve told me he was just so cold. His temperature read 101.7. I grabbed Tylenol and a half hour later it read 103! Got the Motrin, but fifteen minutes later it read 105.1! I was so scared. He was shaking and shaking, Hudson needed me, and Cohen was coughing so hard in the next room, I just knew he had something, too. With help from a sweet friend, who is a nurse, we chugged some Rehydrate and brought his temperature down to where he could finally sleep. The doctor says it’s an infection possibly sinus or bronchitis. Our babysitter has a sinus infection, and Cohen tested positive for the flu after waking with his own 102 temperature. Hudson and I took to the nursery with the air purifier and camped out in there for a few days. The hardest part is seeing Cohen (with a mask on and changing my shirt every time I come in contact with him, which isn’t that often) and not being able to help my baby at all. Through all this sickness, we still had to be on top of Hudson’s treatment. Back to seven days of the bone marrow rebuilding drug, Neupogen that goes in the blue pump. Also pictured are the flushes, primer, and all the other goodies Momma has to hook together to heal our baby boy. And all of it…no matter how stressful, how tough, how emotional; all of it I’d do all over again for moments like this. Thank you, Lord that we will raise these brothers together as it should be. We praise You for this beautiful gift!! -Family and friends who leave food on our doorstep and in our infusion room, call with concern, text with love, and rejoice along with us! -Amazing doctors who go above and beyond. Dr. Kim Kohsla and Dr. Dole are a Godsend. -Sweet Anna, who we prayed for last week, is home safe and recovering…thank you, LORD!! -Chemo. last Thursday will knock the tumor down even more! -Hudson and I do NOT catch any of this sickness! Thank you for sharing our journey with us. I think what I’m most surprised about is how normal our life is right now. Other than Hudson sleeping more than usual, we are just the same as we were before December 10. It’s not like our life has come crashing down on us. It’s not even like I think about it all the time. It’s just a part of our new lifestyle. We check his Broviac when we change his diaper to make sure the dressing is still properly attached. I flush his Broviac once a day with Heparin, and I wipe him down with Chlorhexidine before putting him into his jammies each night. This may seem like it’s not normal at all, but after just two short weeks, it’s just our new normal. No biggie. We still play, laugh, talk with friends, watch movies, celebrate little things here and there that the boys do each day, and go to work. We still do everything we used to, it’s just got a few more steps to it than normal. Hudson is so happy, and is getting close to rolling over back to belly. He loves looking at his big brother and staring at the fireplace. He loves when we talk to him, and especially when we read to him. He’s loving being a thumb sucker, and I secretly love it, too. When I look at the big picture, we’re going to be okay, and we are okay. We have to keep positive to make life fun and healthy and loving for our boys. If anything, we’re growing closer as a family each time something new comes up with Hudson. Best of all, we are growing in our faith in the LORD though our walk with Him has taken this unexpected turn. ~Hudson has lost many of his nodules, but he still has four major ones that are yet to go away. ~That Hudson and Cohen will do just fine when I go back to work on the 6th. ~That a little girl named Anna, whose momma has posted about her heart surgery coming up on Friday will be laid on the hearts of everyone reading this blog, too. Lord, please heal her sweet little heart! ~That the body scan will show Hudson’s tumor has shrunk considerably. ~That my students aren’t affected by my need to leave and be with Hudson when I need to be with him. That they will still learn a lot from me and take important lessons with them that will help them in high school and beyond. That I can be a good teacher for them even though my heart and mind are here with my boys. ~Friendships that the Lord has given us. I cannot believe how many people are so compelled to pray for Hudson and our family, write us sweet messages, and just stick by us through the tough and celebrate the good with us. What a blessing every single day! ~Another nodule that was on the back of Hudson’s head, and a source of constant concern is GONE…GONE GONE GONE! ~That I found a homemade recipe for wipes that I love and will feel so much more comfortable combating “chemo rash” with after our next treatment on the 9th. ~That Mommy and Daddy shared our 10th Happy New Years smooch on the couch after both nearly falling asleep before midnight. Songs. Books. Tummy Time. Comb-overs. Saturday, December 7, Hudson woke from his nap, and it was time for a diaper change. When he stretched out with his balled-up fists reaching for the sky, I went in for our routine tickles and raspberry belly laughs. What I found made my heart drop.